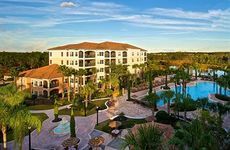 Find WorldQuest Orlando Resort deals, discounts and special offers. Just two miles from Walt Disney World, this hill-top resort offers villas, golf, tennis, and pools. A boutique hotel with 115 rooms, the Celebration is 5 minutes from Disneyworld, has a dining room, and a pool. Located near Walt Disney World, the hotel has state-of-the-art technology and fine dining establishments.